Day of the Dead — Dia de los Muertos — is one of the many Mexican holidays that blend Spanish Catholicism with pre-Hispanic, indigenous mystical rites. 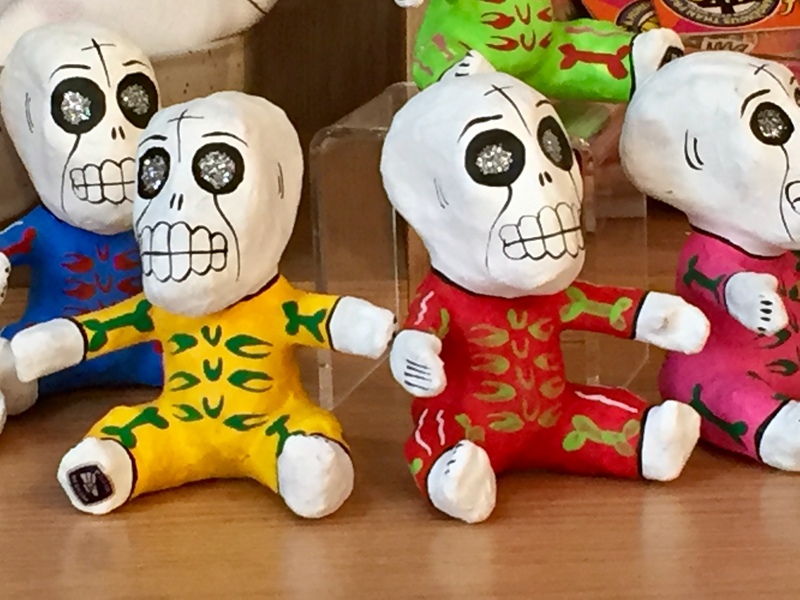 Despite political rhetoric, with a culturally permeable border, Halloween has crept into Mexico and sugar skulls have crept into the U.S.
My friend Sue said, I thought Day of the Dead was on November 1. That is when it starts, I replied. It continues through midnight, November 2, when we accompany the spirits of our loved ones back to the cemetery, and sit at the gravesite with them to ensure a tranquil return to their eternal resting place. November 1 is All Saints Day. November 2 is All Souls Day. My Durham, NC, altar — under construction. What’s missing? On October 31, All Hallows Eve or Halloween, with Celtic origin, there are children’s masquerades in Oaxaca to remember the young ones who have left earth at an early age. In the village where I live, Teotitlan del Valle, Day of the Dead conjures up a celebration of life and its continuum. Death is merely a continuation of life. We see this greca symbol woven in the rugs and interpreted as the steps through life, from infancy to adulthood to old age to death and then the pattern repeats. Circular. Continuous. 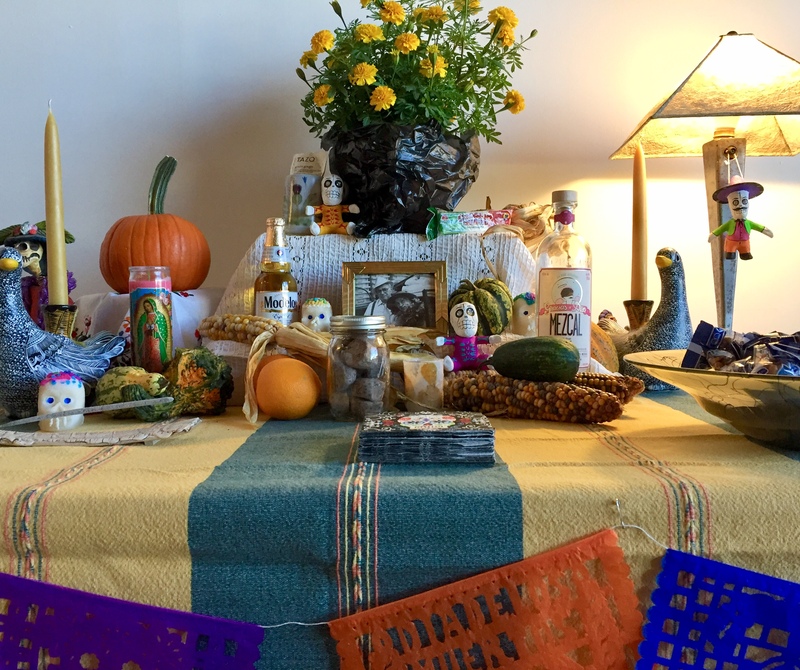 There is something reassuring and elemental about this, which is why I love this spiritual approach to living and dying, why it is easy for me to build an altar and celebrate the lives of my ancestors. 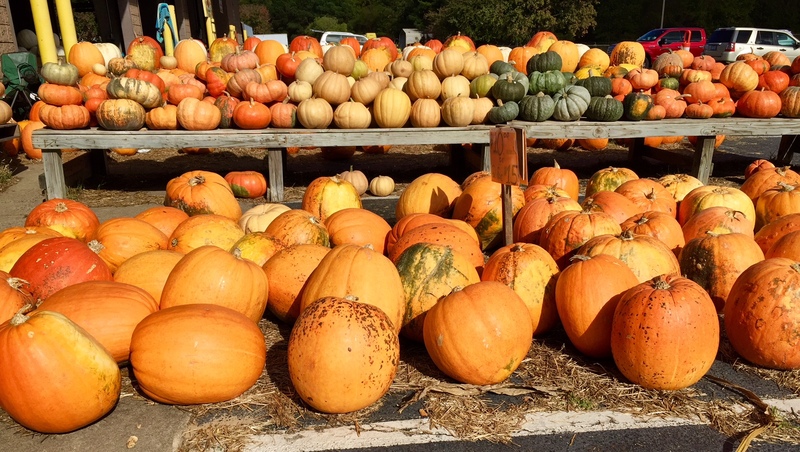 This time of year also conjures up abundance. 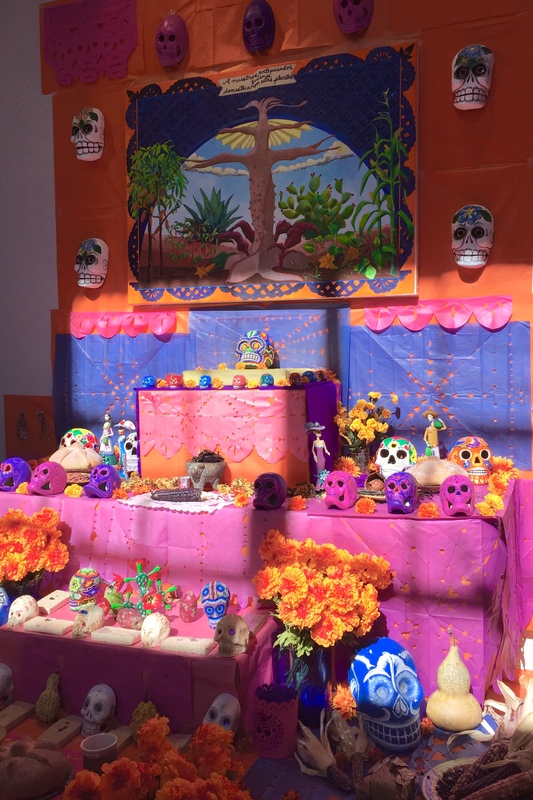 Altars are filled with bread, chocolate, fruits, beverages and edibles that the deceased persons we honor enjoyed. 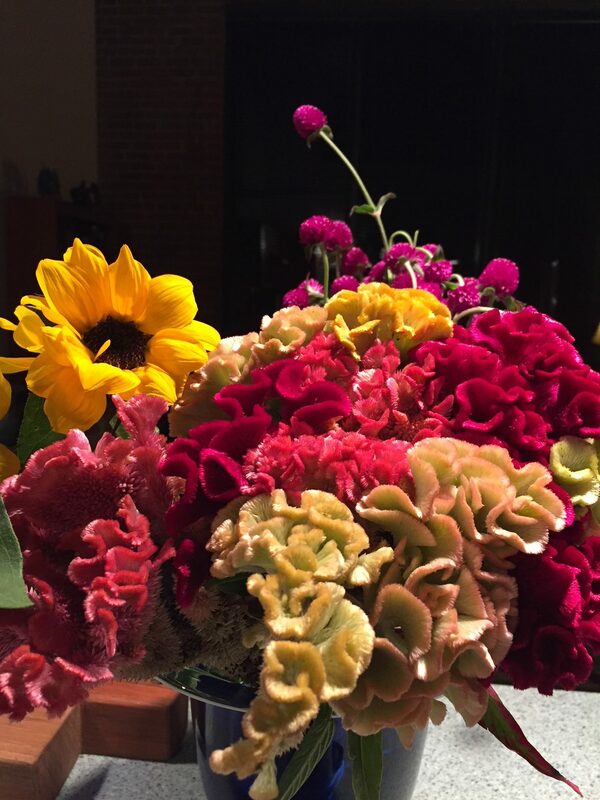 It is harvest time, when the sun sets early and we want to cozy up with our memories. There are photos now of our loved ones on the altar. But not long ago, before access to cameras in small villages, people sat on the floor with altars on the floor, slept on the floor atop handwoven palm leaf petates. They conjured up their memories, visions of the deceased. They lit candles and kept the flame burning for 24-hours. They lit copal incense to entice dead spirits back to earth for a visit with the heady aroma. 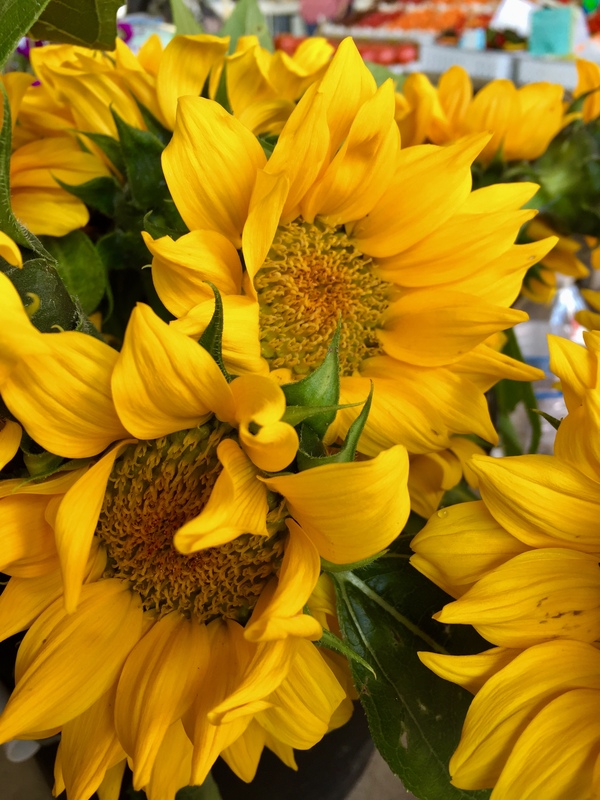 They cut wild marigolds, also called Mexican mint marigold or winter marigold, a variety of tarragon, and put them in gourd vases, another scent to bring the ancestors home. My own altar is now under construction. It will be finished by November 1. On November 2, from Durham, North Carolina, I will sit with the memories of my parents, Dorothy and Ben, light candles and copal, honor them. On November 2, in Teotitlan del Valle, my friends and neighbors will share a comida midday meal with the spirit world. At 3:00 p.m. the church bells that have been tolling continuously for 24 hours will stop. Families will then go to the cemetery, sit quietly, drink beer and mezcal, bring an evening meal, consider the meaning of life and death. Their ancestors graves will one day become theirs. The plots are familial; graves are recycled every ten years to accept the body of another, old bones moved aside to make way. A reassurance. Many spiritual traditions have an annual day of memory. In mine, we light a 24-hour candle on the anniversary of a parent’s death. I will do that, too. It is good to always remember. Wherever you live, I bet you can assemble your own altar. 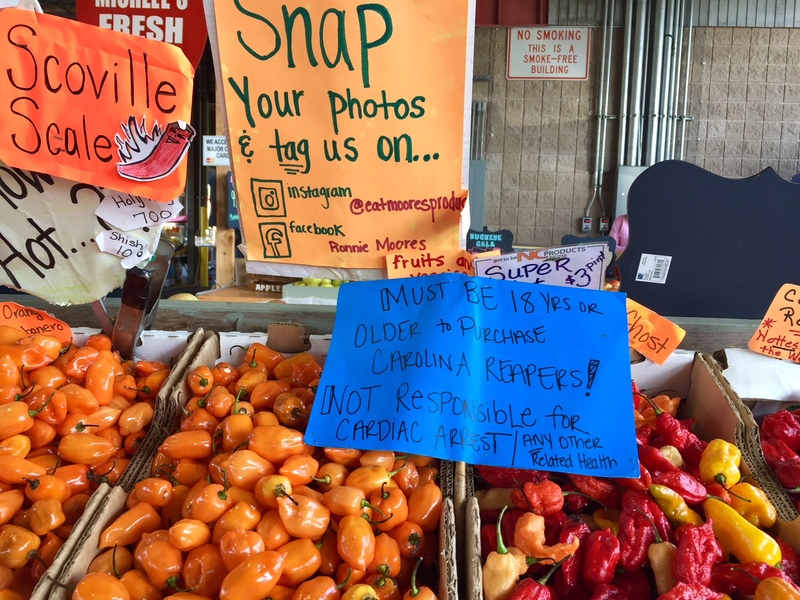 Look for farmer’s markets, Mexican groceries, art centers that want to merge multicultural practice to promote appreciation. The papel picado came from a local gift shop. The sugar skulls from the local Mexican sweet shop. What’s missing? Pan de muertos. I’ll buy that next week.